Kalkhoff is a German company that has a rich history in the bicycle world that dates back to 1919 when 16-year-old Heinrich Kalkhoff founded the company in his family home. As a postman, he often had flat tires, which led him to initially look for deals in bike tires and accessories. By 1923 he’d already built a production facility on his family’s lot and was producing his own frames. Fast-forward to 1936 when Kalkhoff had a staff of 40 employees and was producing 250,000 bicycles. Their philosophy of good German handwork, low prices and making bikes that met the needs of cyclists in Germany, as well as other countries, put them on the road to success beyond their borders. 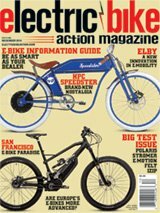 When the popularity of e-bikes began to surge, Kalkhoff jumped into the electric realm with several bikes in the trekking, city and urban commuter styles. The Durban is the urban cargo bike, designed for commuting and picking up groceries on the way home. Kalkhoff actually makes two versions of the Durban—the Advance G9 and the smaller Compact G8 that rolls on 20-inch wheels with a low, ladder-style frame. The Advance G9 itself has two options—a diamond frame or what they refer to as a trapeze-style, low step-through frame. The Durban is well-suited for urban cyclists owing to the two racks that are included, in addition to full-coverage, low-profile plastic fenders to keep your clothes clean and a chain guard to keep your pant leg out of the chain. Despite its sedate appearance, you’ll still be seen because of the bright front and rear AXA Blueline 30-series LED lights. The large external battery on the downtube is the only thing that shouts, “E-bike!”, as the motor is hidden between the rear cassette and disc rotor. The Shimano drivetrain with a trigger shifter is a nice touch. For a cargo bike, the Durban is fitted with a relatively small rear hub motor from Bafang that’s rated at 250 watts and 32 N/m of torque. This doesn’t sound like a lot, yet in practice, it provides plenty of hill-flattening power. The whole system is what Kalkhoff calls their Groove Go System. The battery is large on the frame yet boasts a mere 252-watt-hour capacity. It was selected to keep the cost down, but it’s a tiny battery in an age where 500–750+ Wh is the norm. This definitely affects the range. There are no controls on the handlebars for the motor. The only control for the system is the button on the battery. To turn on the system, you long-press the button and it springs to life with green LEDs showing how much battery capacity is left via one to five green lights. Then it switches to blue LEDs and shows you the power level. It starts at five lights (high power), then, pressing the button, gets you to three lights (medium power), and one more press gets you to Eco (low power). You have to set the power level before you mount the bike. There’s an elegance to this simplicity. Set it and forget it. If you don’t want so many bells and whistles, this is great. If you prefer more control, this can be maddening. The indicator lights are hard to see in bright daylight, and you can’t really tell how much battery is left. The Durban is a commuter/cargo bike made for extreme simplicity. It’s perfect for someone who wants a simpler bike with reliability, carrying capacity and an inexpensive price. It can carry up to 285 pounds of rider, plus cargo, and even with the relatively small motor, it makes getting up hills easy. The bike itself has great fit and finish, just what you’d expect from a company that’s been making bikes for the better part of a century. You have to adjust the saddle height before you set off. Unlike the wheels, there’s no quick release here. There’s also no suspension, so with a rigid aluminum frame and fork, you’ll feel the road and every bump in it. The rear rack is a little less beefy than the front rack, but still a perfect mount for panniers or a platform to strap other cargo onto. With the rack being mounted to the fork instead of the head tube, it turns with the handlebars and front wheel, making it visually react much more what you’re used to on a bike without a front rack. The Bafang 250-watt rear hub provides plenty of power for hills. A 1×8 gearing setup let us start easily and not run out of gears on flat ground. The battery looks huge on the bike, but its capacity is a mere 252 watt-hour. If you’re used to being able to toggle the battery power while riding, perhaps keeping it in low or middle levels on flat ground and only hitting the top power level when you get to a hill, the “set it and forget it” setup on this bike then may be off-putting. If you normally don’t switch power levels or this is your first e-bike, this may be perfectly fine. When moving, we found that the top level was really fun and zipped up to 20 mph in about six to eight seconds, depending on rider pedal input. The middle level took a little longer, but not much. It feels nearly as powerful as the top level. Eco feels like it’s barely on at all. It uses both pedal and cadence sensors and feels very natural while still making you feel like Superman. The AXA LED lights included are really bright and work well as daytime running lights or some illumination at night. Since the front rack is attached to the fork instead of the head tube, any abundance of weight can tend pull the bike over. Once the cargo is mounted on the bike, however, the weight feels well-balanced. The Durban is an attractive, easy-to-use e-bike at a great price for the quality of bike delivered. It’s German-designed with a proven motor, and the ride, fit and finish are all very nice. The lack of controls on the handlebars may be an issue for some but a relief for others. The short range of the bike is acceptable for commuters with less than five miles each way to travel, unless you’re going to only use Eco mode. In that case, you may want to look at a regular non-e-bike. Sizes: Diamond: M, L, XL.